Where do I start? I have had Cushing symptoms since the late 1990″s. I was tested for cushings and was told that I did not have it. Then in 2007 I was diagnosed with a tumor in my adrenal gland, mind you I still had symptoms off and on since the 90’s. I went to every endocrine in the Fredericksburg area and was on the OR table to have my adrenal gland removed when the Endocrine said that Cushings was not completely ruled in as what was going on with me, despite 3 24 hour urines showing elevated cortisol levels. Then I went to this doctor then that doctor…….still saying they couldn’t confirm my diagnosis. In October 2007 I was admitted to the hospital with a pneumonia and did an MRI of my head (again) because I was having severe headaches which showed a lesion of some kind. After 6 weeks of IV antibiotics and a repeat MRI I decided that I should go see a neurosurgeon. As soon as I walked into his office and never saying a word with medical records in my hand he said “Have you ever been worked up for something called Cushing Syndrome? I replied yes and he said you are very sick and need to have it taken care of and sent me to Georgetown Hospital in Washington DC….where I saw a surgeon and had my right adrenal gland removed 12/29/2008. I have been pretty healthy until about 18 months my primary doctor was concerned about my heart rate being so high and my brother had just had a quad bypass surgery and sent me to the cardiologist. My heart rate has never been lower than 100 since I can’t remember…..and back in March 2014 I started having weakness going up the stairs, then in September my hips and back started hurting and I was having problems falling asleep and staying asleep. My HbgA1c was 13.7 and I could not figure out why my blood sugars were spiking despite being on a diet and insulin. My cortisol level was normal in October. I started a really strict diet and not cheating the week of Christmas…..yes I know crazy…..I was only eating veggies, protein and 2 fruit servings a day…to detox my body….I gained 6 pounds. When January came and I had to see my cardiologist for a follow up my heart rate was 128 and I i had gained 17 pounds in four weeks and guess where it all was…..my abdomen…..I felt like my Cushings had been causing havoc on my body. I was noticing the thin skin and bruises that wouldn’t heel. But I was thinking this can’t be returning until my cardiologist ordered that dreaded 24 hour urine and my levels were 98….2 times the normal…. I just did a repeat last week and had a MRI of my abdomen which the urine was guess what positive for elevated cortisol and the real shocker came today when my doctor called and said my MRI showed both adrenals….but how can that be I had the right one removed in 2008 that had a 4cm tumor in it??? 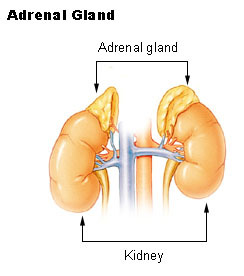 My doctor is wondering if there was residual tissue left behind and what seems to be an adrenal is really a tumor??? Has anyone experienced a re-growth or Cushings for a second time…. My doctor is trying to get me into Georgetown asap because obviously the beast has returned. Thank-you for your support and understandings in advance!!!! !